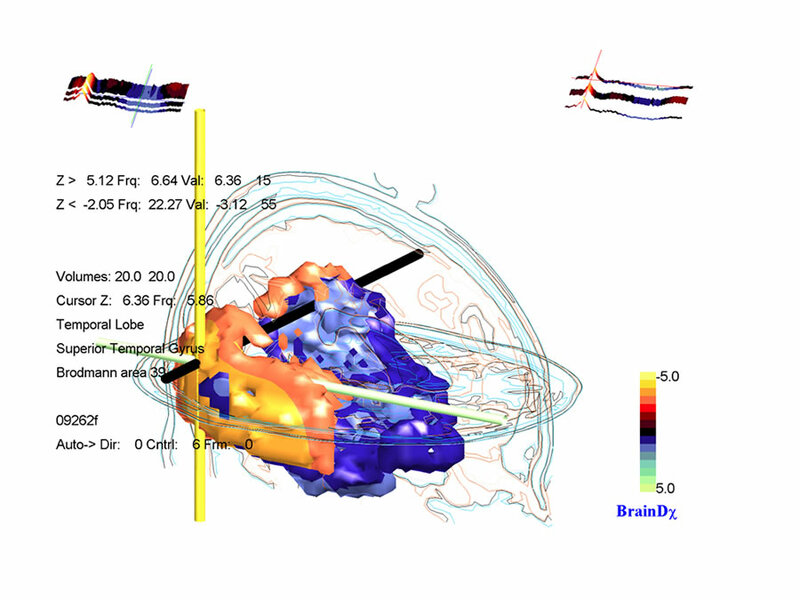 BrainDx has developed software to produce an interpretive report based upon Neurometric Analysis. 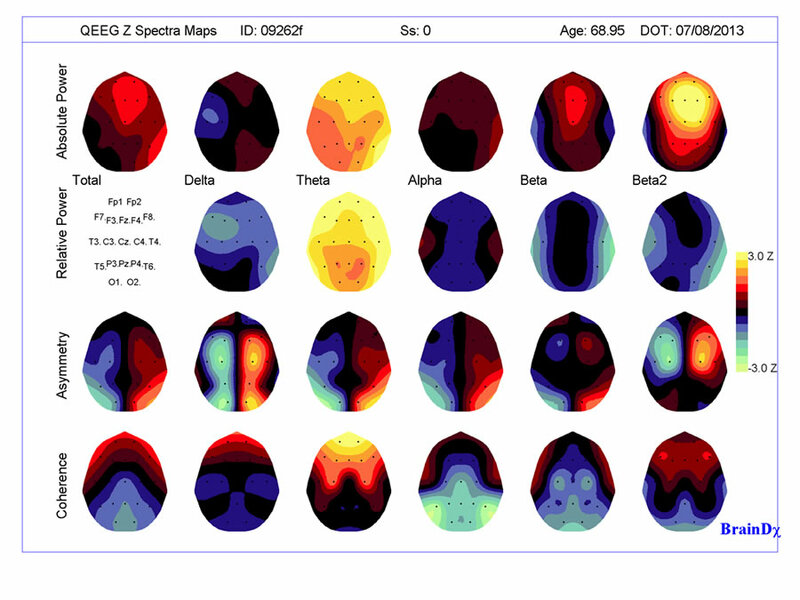 This tool for quantitative electroencephalography (QEEG ) is a software-based, healthcare technology that will facilitate the diagnosis and treatment monitoring of a number of psychiatric, developmental, and neurological brain disorders. 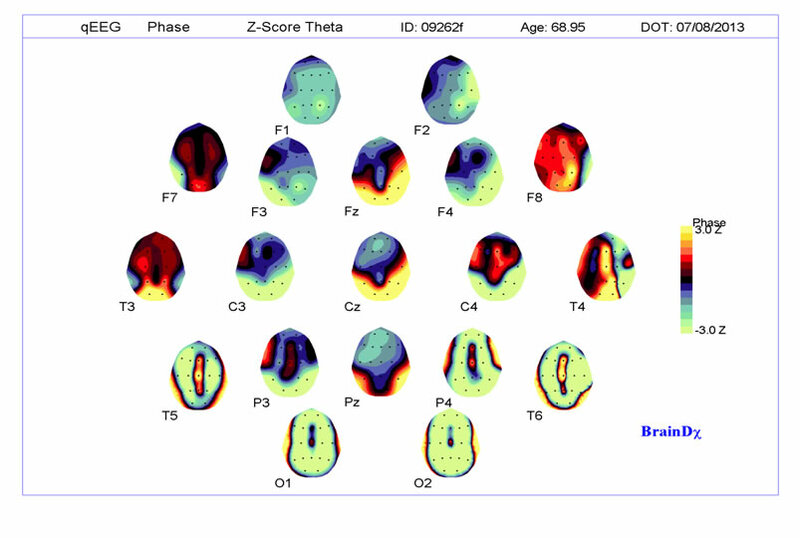 Two to three minutes of artifact-free digital Electroencephalogram (EEG) input is compared to a continually refined and expanded, normative database and a clinical database of over 10,000 patients with DSM/ICD diagnosed brain dysfunction. Used in addition to other data derived from the individual patient history, the software interactively generates a clinical report on any computer. Data is imported (translated) from files generated by most commercial EEG equipment. All translators have been adjusted to compensate for significant differences in transfer functions (frequency response). Results are presented in a structured and adjustable format with annotated illustrations, documentation, and opportunities to insert clinical observations. 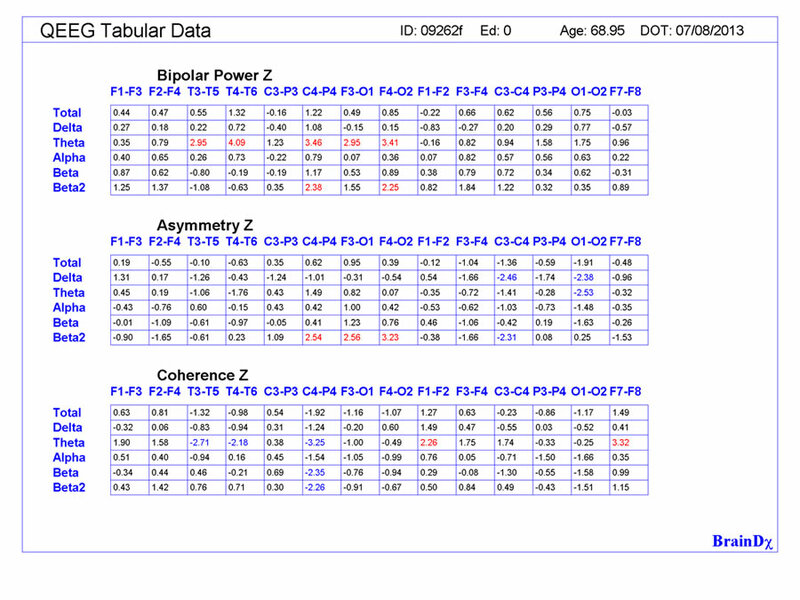 The Subject [ID: GE-70-09262-] was 68.95 years old on the date of testing 07/08/2013. 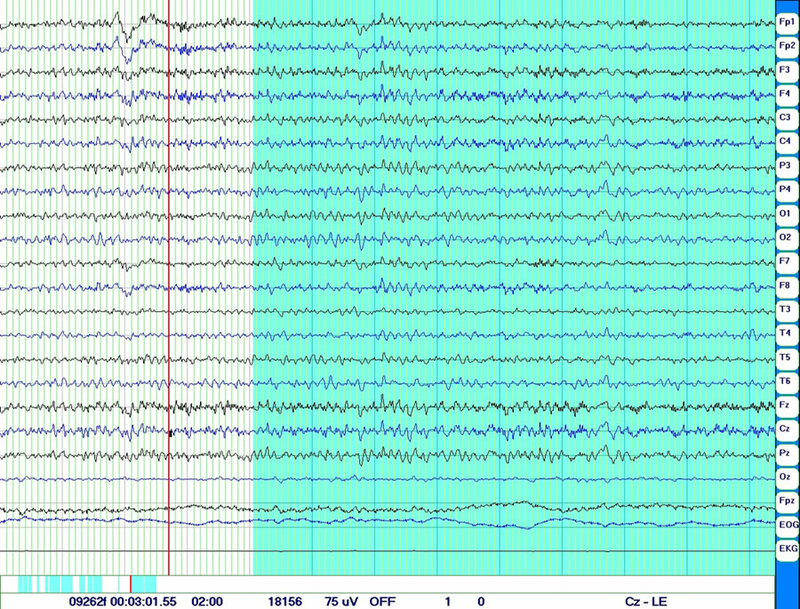 An EEG recording of 18.0 minutes was acquired and 2.0 minutes of artifact free data was selected for analysis. This classification is a multivariate statistical summary of a neurometric evaluation and serves only as an adjunct to other clinical evaluations. Please refer to the enclosed Appendix or the referred bibliography for a more precise definition of the respective measures. 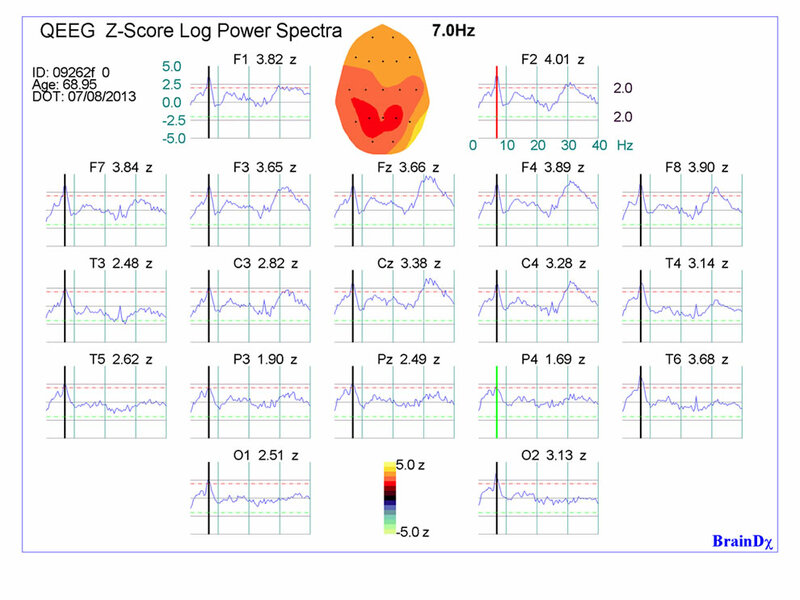 The high resolution frequency spectra are shown below at each scalp location for Z-Score Log Power Spectra. The Cursor is at 7.03 Hz. The Maximum value at for this frequency is at F2. The Blue Volume encloses 20% of the Grey matter with Z value Less than -2.0. The minimum value is -3.1Z at 22.3 Hz. The minimum is located at Limbic Lobe, Parahippocampal Gyrus, Brodmann area 28. The Red Volume encloses 20% of the Grey matter with Z value greater than 5.1. The maximum value is 6.4Z at 6.6 Hz. The maximum is located at Temporal Lobe, Superior Temporal Gyrus, Brodmann area 39. Each image summarizes results for the gradient between a labeled region and all other regions. Shown is the measure of Coherence for the Theta Band. Each image summarizes results for the gradient between a labeled region and all other regions. Shown is the measure of Phase for the Theta Band. 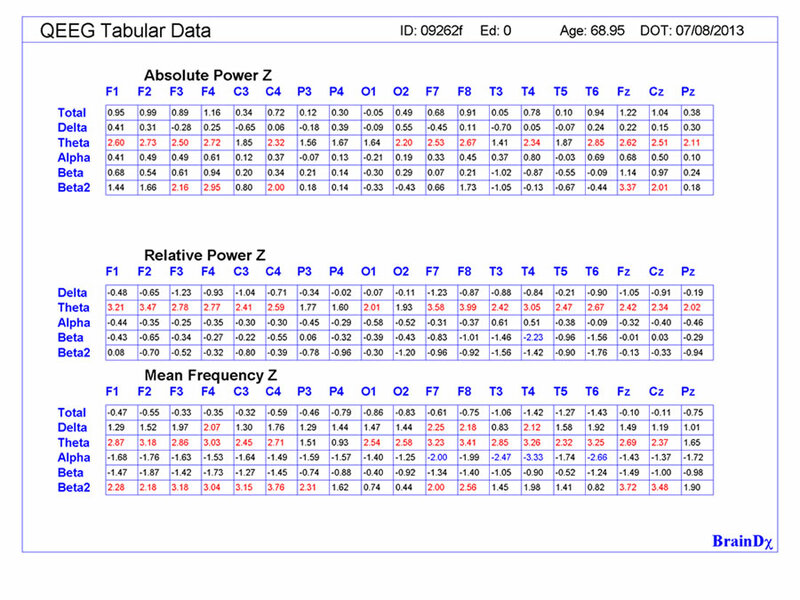 Selected Z-Score Measures of Absolute Power, Relative Power, and Mean Frequency. Cells are Red when Z > 1.96 and Blue when Z < 1.96. 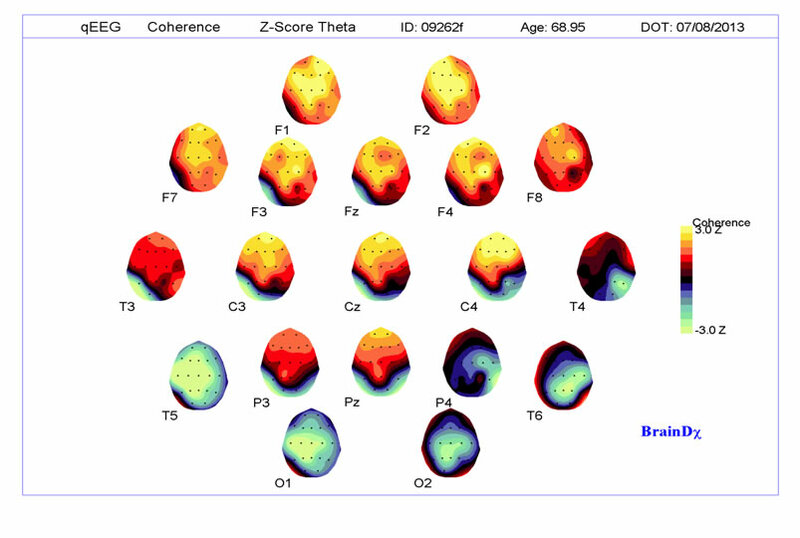 The enclosed results represent statistical deviations in electrophysiological measures of brain activity from expected values for this age. Dysfunction of brain regions as indicated typically correspond to functional or behavior problems. Neuropsychological performance testing should be considered whenever possible to delineate functional or behavior impairments and to establish pre-treatment performance levels which can be used to establish treatment efficacy from follow-up treatment. This report is intended to provide a guideline for clinical use and should not be used as the sole source of information for clinical diagnosis or treatment selection. BrainDx will not be held responsible for any fault in the clinical diagnosis or failed treatment resulting from statements in this report for the service provider. Should the clinician be concerned about the presence of epilepsy, neurological abnormalities or the findings described below referral for a conventional EEG may be warranted.